All of these gold bars are in mint condition. Shipped to US addresses only, please. Note that the types of gold bar holders are redesigned often by gold refineries. Some holders may be of a different style than those pictured. 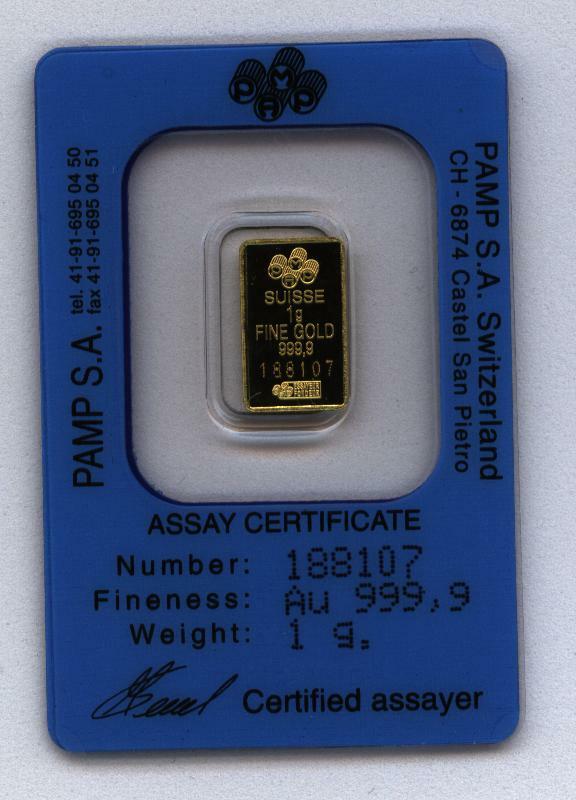 Produced by Credit Suisse -the famous Swiss gold refiners - solid gold! Each gold bar wafer is serial numbered. See image of front and back of bar. Style of holder will be different. About 8mm by 15mm in size - 1 gram , small, serial numbers will vary. Credit Suisse is one of the best known gold refineries! Note that the style of display card has been redesigned by Credit Suisse. Although the gold bars-ingots remain of the same design, the holders may look different. Save with this 10 bar discount! Special - Pure 99.99% GOLD! 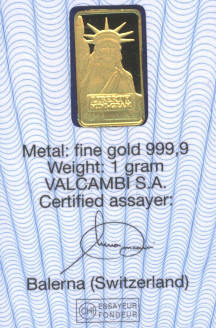 Contains 1 gram of solid gold. About 8mm by 15mm in size - small. Some say it depicts the ancient "Fortunia" - goddess of good fortune or good luck. In original Serial numbered refiner's display card holder. Style of gold bar holder may vary. Small - about 8mm by 15mm in size. These pure gold ingots were minted by the famous "Credit Suisse" refiners. In original Serial numbered refiner's display card. Each ingot bar wafer has its own unique serial number. Styles of holders will vary. Images enlarged to show detail. Note that the style of display card has been redesigned by Credit Suisse. Although the gold bars-ingots remain of the same design, some holders may look different. Pure 99.99% GOLD! Contains 2 1/2 gram of solid gold. Some say it depicts the ancient "Fortunia" - goddess of good fortune or "good luck". Serial numbered and still in the original plastic ingot card. Looks like the 5 gram bar pictured, only smaller. Pure 99.99% GOLD bar- ingot! These small 1 gram of solid gold wafer-like ingots are about 9mm by 15mm in size. 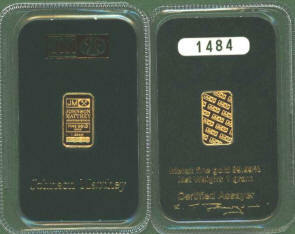 Each is serial numbered and packaged by the famous Johnson Matthey precious metal's refinery. 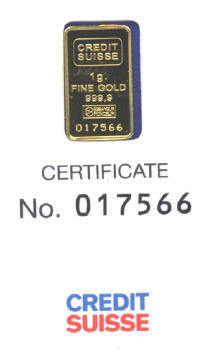 Each gold bar is housed in the original green Serial numbered refiner's display ingot card. The clear plastic containers pictured are sometimes called blisters. Image of front and back. 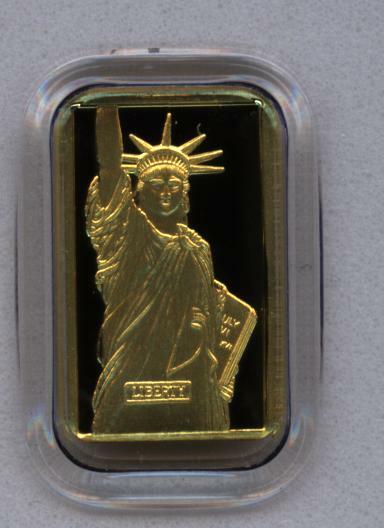 Produced by the PobJoy Mint refiners - 99.99% solid gold. Still in the refiner's plastic sleeve. 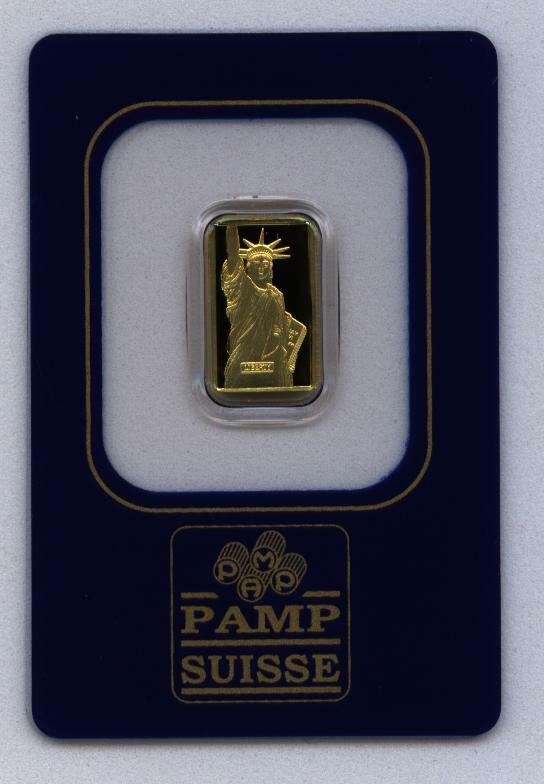 These pure gold ingots were minted by "Pamp Suisse" refinery. Housed in the original Serial numbered refiner's display ingot card. Each gold wafer bar has its own unique serial number. This style is OUT OF STOCK. Shop for gold and silver coins, collector supplies, and sports cards. 1,000+ happy customers. PayPal, money order and checks accepted.